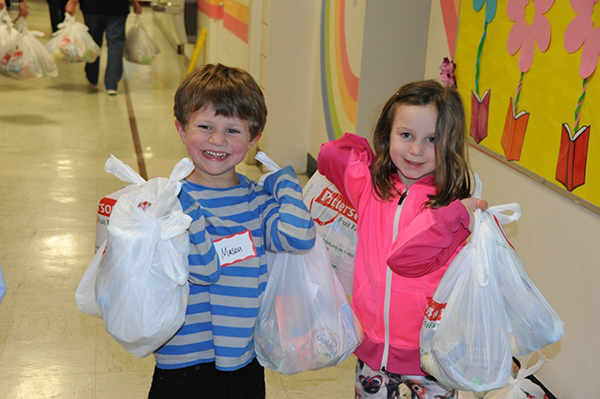 On March 25th, friends and families of Mayfield Church in Chesterland (Western Reserve District) packed 750 bags of healthy snacks for students at Rowland and Adrian Elementary in South Euclid. The packing took place in the Rowland gym. Under the supervision of school counselor Karen Jones, 450 bags were taken to each classroom. Then a group of families transported 300 bags to Adrian, and did the same at that school. More than 60 percent of the students receive free breakfast and/or lunch, so these snacks will help families that depend on those meals. This is the sixth year that Mayfield has been privileged to partner with Rowland and Adrian. The church provides tutors and teacher assistants, helps with school events and PTA programs, provides teacher appreciation gifts and meals, and has shipped more than 30,000 new books to the two schools.